MetalRockNews: Nikki Sixx: "Writing process for 'Motley Crue' was painful"
Nikki Sixx: "Writing process for 'Motley Crue' was painful"
Motley Crue and Sixx:A.M. bassist Nikki Sixx was recently interviewed by Sweden Rock Magazine, you can read some excerpts below. 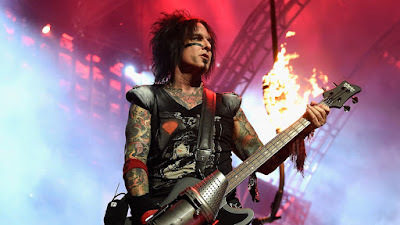 About his thoughts on "Motley Crue" album, released in 1994, he said: "I've gotta tell you, I think it was a very unfocused record. It was painful for me, because John Corabi can't write lyrics, and I had to do all that work. It was the first time I ever had to work with somebody that wanted to participate in the lyrics. And my standard is so high that it was just… It was so hard, it took months... Usually, I write a set of lyrics in an hour. And it's all about having pent-up information and aggression and just [letting it out]. And it was just hard, because he was… a nice enough guy, but he just didn't have that fire, and it was hard for me. And I just felt like [producer] Bob Rock really got us… 'Cause we just really wanted to get the riffs going and stuff, and he captured that. But in general, there's like… 'Hooligan's Holiday''s a good song. 'Poison Apples', I think, was a good song. But in general, it felt like a great-sounding record, but a little bit unfocused. That's just me. Like, the choruses weren't big enough. But it was just hard." About why Mars and Lee have both publicly expressed their fondness for the Corabi-fronted album. He said: "I think Mick and Tommy love that record, 'cause it's [got] great drums, great guitars. And, yeah, I think there was a freedom in having a different singer, you know. But it was just hard for me to have to go slow. I'm just not a good 'slow' guy in the studio. I've been in sessions with other artists where [someone is working slowly] and I've just gotta bail; I've just gotta go. It's, like, you can create on the spot or you can't create. That's it with me. I just don't have patience for that."